The majority of recorded encounters with Beastmen seem to focus on the regions of the great forest within the Empire boundaries – particularly the Drakwald and the depths of the Forest of Shadows, these records describe monsters with bovine or goat heads but human bodies. However the truth is that the Beastmen from these regions are just a small cross section of the vast hordes inhabiting the world after the warp gates collapsed and chaos flowed across the continents unabated. Chaos is anything but uniform in its manifestation and this is reflected in the variety of Beastmen types to be found around the Warhammer World. The Beastmen around the World tend to be a reflection of the local habitat, climate, and most common animal species of the region and prevailing legends and nightmares of the population of that region. Whether the latter is more attributable to the Beastmen influencing folklore or the ability of Chaos to shape the Beastmen into the most suitably terrifying form is unknown – but the effect is convincingly terrifying to the average populace. For example – in the Empire most folklore depicts Daemons as bestial creatures with the heads of goats, hence no coincidence this generality matches the appearance of the Gors of the Drakwald Forest. A curious type of Beastmen is known to inhabit the Blackspines in the lands of the Naggaroth, this scaled creature typically stays in the shadows of the mountains or caves at least during daylight hours – they are taller than a man, as high as an Elf more like and are covered from head to toe in craggy scales, they are not particularly evolved and still brandish stone axes or clubs as weapons. But they are numerous and from time to time are known to either form raiding parties or latch onto a greater warband of Chaos off towards some greater objective of mutual benefit. In the lands of Indhya and Khuresh the Beastmen are different again, these ferocious beasts have the heads of giant hunting cats similar in appearance to the common Tiger, Lion and Panther – the jungles in those lands are dense and humid and the peoples of those lands know not too venture too far into the interior, as few who do ever return to tell of their experience. Some believe these great Cat-Beastmen to be capable of malevolent actions, and stories have come to light of advancing armies of Goblins or Skaven reaching the gates of the villagers only to be suddenly attacked by hordes of shrieking Cat-Beastmen, ripping through their ranks slashing with their extended talons – leaping high in the air their weapons glinting in the sunlight and then crashing down into the sallied ranks of the enemy, moving almost too quickly for the human eye to track – darting this way and that, surprisingly so for beasts of their size, balanced and agile but capable of delivering devastatingly powerful blows to anything foolish enough to stand still for long enough. Exactly why the Cat-Beastmen chose to attack on these occasions is probably not as selfless as some would like to believe however, and certainly should not be taken as any indication of a bond between Cat-Beastmen and man, for they surely resent and despise Man as much as any other Chaos mutated Beastman – likely as not the Cat-Beastmen view other races such as Greenskins or Skaven or even Lizardmen as rivals to their territories and without a doubt ambush is all Beastmen’s preferred method of combat. In several regions in the East some of the lesser evolved tribes of humans (particularly the Malays of Khuresh) worship of the Cat-Beastmen appears to be common practice, so much so that armed units of humans will go into battle alongside the Cat-Beastmen – adorning themselves in furs, and feathers and wearing other garments representative of the great Cat Beast warriors or other Beastmen tribes they live near. The men of Araby and explorers from the Old World have long known of the Ape-Beastmen of the jungles of the Southlands, although some are reportedly little more than lumbering bellowing giants wielding massive two handed axes and hammers and others skitter around screeching and clawing at the enemy, it is said that they are lead by upright intelligent Apemen who speak a dialect of language of Men of the Southlands. 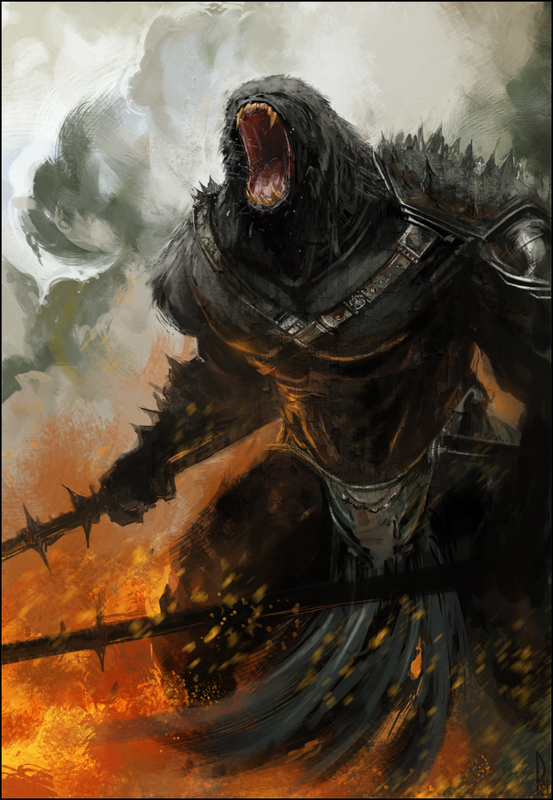 The hordes of the Ape-Beastmen of the Southlands differ from other Beastmen warherds in that they are organised in a fashion similar to any other armed units from other civilised nations – there will be units of shock troops, mounted warriors, ranged weapon units and armoured elite warriors. Their weapons and tools are not just looted from other races but clearly constructed themselves and reports are they live in fortified villages deep within the jungles of the Southlands, frequently fighting massive battles against the Lizardmen or Savage Orcs of the region. Would be a reskin enough and refreshing for those Beastmen of Naggaroth and Dark Lands? you should at least have given credits for that wall of text you "stole". 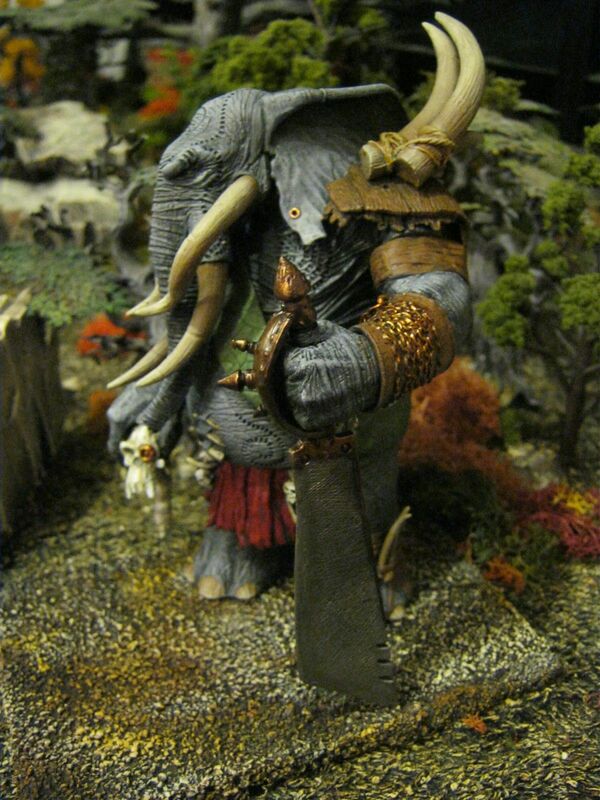 Alternative beastmen Lord Elephant, this could be something about Ape-beastmen or an equal to minotaur? It's an african elephant for sure. 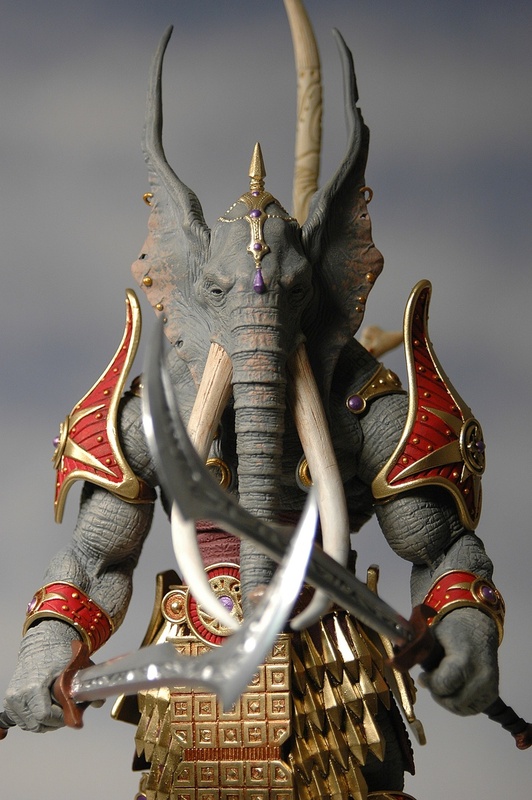 Maybe the horns can be hidden and every unit reskinned to a local equivalent: ape, cat, spineback.. With creative painting of details can be done and a minor retouching when needed, but I think they shouldn't create armies from 0, a reskin with sligtly model retouching could work. What about the Araby Beastmen who can turn into giant blobs? The Araby beastmen are apes, sadly is the least interesting of the other breeds outside old world. Spinebacks and Catfolks are very interesting. I heard Araby Beastmen are the smartest in the whole world. That's why they build spaceships and left before Chaos blew the planet up. Everyone who stayed behind, especially the people from Albion were angry that their brains were too small to do the same. You are not going to trap me there on your nonsesical inferiority cultural complex. End Times were bad for everyone. I liked much better WH Fantasy over Age of Sigmar. Lets be honest they aren't going to add new models for Beastmen unless it's their missing army book units. I mean the Dwarfs aren't even getting a proper rune system. They are pretty much focusing on the newer races which honestly is where their focus should be in terms of models. Got to have it in for the Kingdom of Ind. There's already Beastmen Angels their called Harpies. Chaos is sort of divine in the Warhammer world. It's evil but it's certainly a higher divine power. And Angels don't exist in Warhammer Birdmen and Harpies do. that's true, to bad thanI am more on the low divine side of things. Like beastmen, TK, Ogre Kingdoms and Nagash. High Elves are starting to appeal me, too underdogs are interesting to powerplay. That's why I want to help to give something something to DoW and talk on alternative things of Warhammer Universe. Do the other Beastmen type are mutant from corruption too? I like them but they look out of concept from Greek-Monster army. Araby > rest of the WH world, FACT. The reason GW never made an Araby army book is because they knew they'd clean up Chaos, undead and Greenskins so fast, there would only be peace and prosperity left in no time flat! @Equix What about man bear pig? Can't be a beastmen without the magic from the chaos realm. Creatures are altered in different ways, and even many are new creations. Other places where there is small mentions of tigermen, and all this kind of stuff is unique to them. Just like werewolves are unique to Norsca and some parts of northern empire. We're not even getting the other type of Beastmen near Naggaroth, what makes you think CA will touch any of the other obscure types?